We all sit down to breakfast with the best of nutritional intentions. But even if you’ve managed to avoid the temptation of the doughnut case, the sugar-dosed latte, and the butter-smeared bagel, you’re still not out of the danger zone. Outmoded, debunked ideas about what makes a morning meal “healthy” could be steering you toward bad choices. Time to break your breakfast habits. Follow these guidelines, fueled by the latest research, and reap the rewards of a truly smart morning meal. 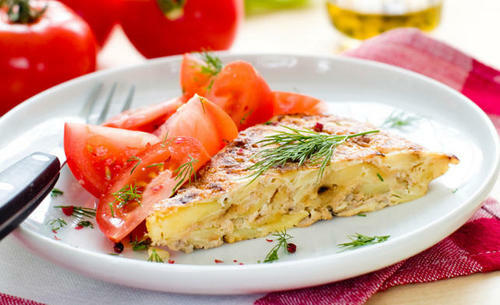 If you believe that ordering an egg-white omelet is a sign of nutritional virtue, your thinking is definitely scrambled. Emerging science shows that eating whole eggs actually reduces your risk factors for heart disease. Case in point: A 2012 University of Connecticut study had volunteers consume either three whole eggs a day or the equivalent amount in yolk-free egg substitute for 3 months while following a diet with a moderate number of carbs. Both groups experienced drops in triglycerides and oxidized LDL (bad) cholesterol, two risk factors for heart disease. What’s more, those eating the whole eggs saw a bigger boost in their HDL, which helps lower cholesterol. “Egg yolks seem to increase the amount of cholesterol delivered to the liver for removal from the body,” says study author Maria Luz Fernandez, Ph.D. Besides, yolks are loaded with vitamin D, vitamin B12, selenium, and choline. And the extra protein will silence your hunger. A study in Nutrition Research found that men who ate an egg-based breakfast consumed far fewer calories when offered an unlimited lunch buffet, compared with men who ate a bagel-based breakfast of equal calories. Don’t save eggs for weekend brunch. “Men can reap a range of health benefits by consuming one to three eggs a day,” says Alan Aragon, M.S., the Men’s Health nutrition advisor. Hemp, chia, and flaxseed may sound as granola as, well, granola, but they pack a potent array of benefits—and breakfast is the ideal time to work them into your diet. Since they’re mild tasting and slightly crunchy, they can slip unobtrusively into a range of morning meals. “A daily tablespoon or two of flaxseed, chia seeds, or hemp seeds is an easy way to boost your intake of heart-healthy nutrients,” says Aragon. Choose chia seed or ground flaxseed for an extra dose of dietary fiber. (Bonus: Flaxseed also contains lignans, a class of disease-fighting antioxidants.) Or try hemp seeds, among the few plant-based sources of complete protein. Stir 1 to 2 tablespoons of flaxseed, chia seeds, or hemp seeds into a bowl of oatmeal or yogurt, or blend a serving into a smoothie. Still think a low-fat breakfast is a healthy one? In a new, 5-year observational study published in the New England Journal of Medicine, Spanish researchers found that a Mediterranean diet including extra-virgin olive oil or tree nuts reduced the risk of heart attack and stroke by 30 percent, compared with a control group advised to follow a traditional low-fat diet. “The olive oil and nuts supply polyphenols and vitamins that fight inflammation,” says study author Miguel Angel Martinez-Gonzalez, M.D., Ph.D., professor in the department of preventive medicine and public health at the University of Navarra in Spain. Start your day on the Mediterranean diet with a Greek-style salad for breakfast. Toss together ripe tomatoes, crunchy cucumbers, olives, and walnuts with an olive-oil and lemon dressing. No time to make a salad in the morning? Make a big batch on Sunday and store the dressing separately—the combo will stay fresh in the fridge for up to 3 days. Or scramble eggs with canned or leftover cooked salmon and your choice of chopped fresh herbs, and top it with a drizzle of extra-virgin olive oil. Not all grains are created equal. Take a cue from the Scandinavians and make foods rich in rye a part of your breakfast arsenal. Whole grain rye flakes, which cook up into hot cereal just like oatmeal, have twice the fiber as whole grain oats. Rye crisps boast the same amount of fiber as whole wheat bread but have nearly 60 fewer calories per two-piece serving.